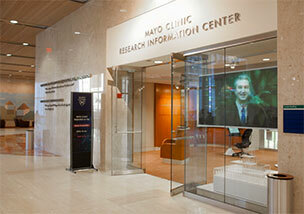 Gonda Building, Street Level Lobby, Mayo Clinic, Rochester, Minn. Discover how Mayo scientists are finding new and better ways to predict, prevent, diagnose and treat a wide range of illnesses. Learn how you could volunteer to join one of our clinical trials.